(Nanowerk News) Nanoparticles are everywhere. From cosmetics and clothes, to soda and snacks. But as versatile as they are, nanoparticles also have a downside, say researchers at Binghamton University and Cornell University in a recent paper published in the journal Nature Nanotechnology ("Oral exposure to polystyrene nanoparticles affects iron absorption"). These tiny particles, even in low doses, could have a big impact on our long-term health. 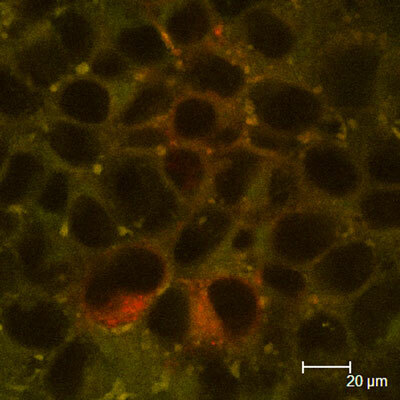 This figure shows 50 nm carboxylated polystyrene nanoparticles (green) interacting with a cell culture model of the intestinal epithelium (red). Oral exposure to these particles was shown to affect iron transport. "We thought that the best way to measure the more subtle effects of this kind of intake was to monitor the reaction of intestinal cells," said Mahler. "And we did this in two ways: in vitro, through human intestinal-lining cells that we had cultured in the lab; and in vivo, through the intestinal linings of live chickens. Both sets of results pointed to the same thing – that exposure to nanoparticles influences the absorption of nutrients into the bloodstream." "The gastrointestinal tract of a chicken has very similar features to that of a human," said Mahler. "We can learn a great deal from the way chicken tissue works which means we can make better predictions about how humans will react."